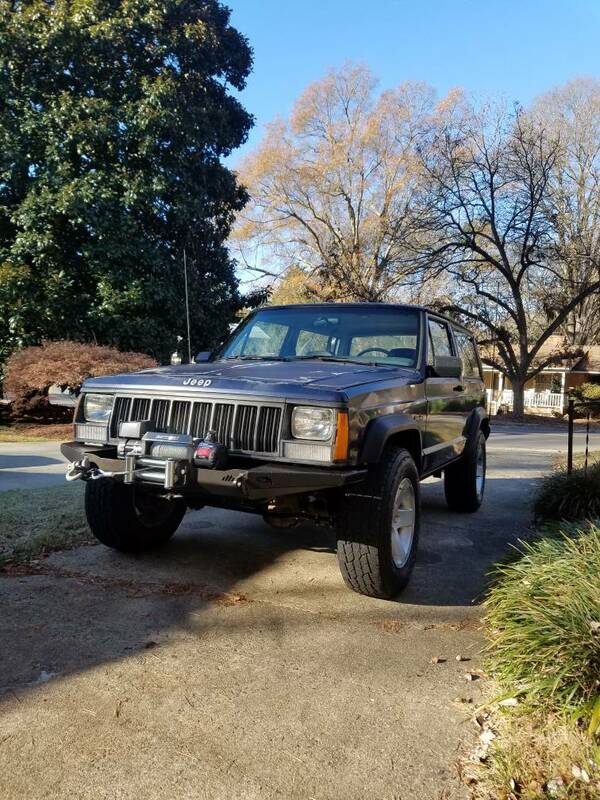 I have an 98 XJ with Upcountry suspension and 235/75R15 street tires. I'm hoping that by getting fender flares and trimming I can fit at least 30x10.5" A/T's comfortably without having to adjust the bumpstops. I do a lot of freeway driving and am trying to hold off on the lift/too much tires for now. Looking at the Naiper flares, Is there a big difference between the V2 and the flat style besides looks? It looks like the flat style may give more clearance, is that true or am I just seeing things? Your Jeep will totally look "wrong" if you put those flares on with out bigger tires and a lift! You would at least need to change the rim backspace. Well what are the "right" size tires for an Upcountry lift (1") with the trimmed fender flares? From reading/searching forums it sounds like 30's are a safe bet. It looks that guy is running 31's with the flat flares but I dont know how much travel they really have. Would the V2 flares provide the same amount of clearance? the flat flares do give more clearance. and a 235/75R15 is usually 28-29" depending on the tire. I would do flares and go 31x10.50. I have 4.5" lift with 33x10.50s and no problem with stock flares so 31s should fit with aftermarket flares no problem. Interesting, yeah its sounding like I might be able to go up to 31's with the flares. That's pretty awesome. deesiexj, I like your setup that is kinda what I am going for, low/minimal lift with big tires as possible. Anything larger than the 29" tires I currently have is probably pushing it and will probably rub a bit, so I probably need to either lift it a bit or get the flares. The flares make a lot more sense right now. Anyone have experience with the E-Autogrilles Fender Flares? No reviews on Amazon but they are a lot cheaper. Made in USA too. Almost worth taking a gamble on. Pre-97 XJs have better fender clearance than the later models. My 01 needed a little trimming, when it was at 2" lift and on 30"s, to maintain as much as much up travel as possible. With bump stopping, no trimming is needed. 1-1/4" wheel spacers were added, later new wheels, to keep the tires from rubbing on the LCAs and to increase the stance. Okay with that in mind I am thinking of doing a 2" lift. I would like to replace the shocks and springs; and they have 2" lift kits that will replace all of that. What order should I do all of this in? Trim Fenders, Get Bigger Tires, then see if I need to lift? Or should I lift 2", get bigger tires, then trim? I don't want tires bigger than 31" (because I want on road drive-ability, and don't want to have to regear) and I don't want to lift more than 2" because I don't want to have to worry about a SYE and a CV. Trying to keep it as low as possible but with as big of tires as possible. Do the lift, get 30"s, adjust your bump stops and then trim. You can run big tires if you don't mind limiting the up travel with bump stops. I prefer to keep the maximum suspension travel, so, when the 01 had 30"s, trimming wasn't a problem to keep the tires out of the flares. At 2"s of lift, you will still need to do a transfer case drop and to add shims to the rear axle to keep the driveshaft vibs at bay. With 31's, I definitely noticed the gear ratio and brake performance degrading and a lot more trimming was needed to keep the up travel . Ok that scares me, that's exactly what I'm trying to avoid. I'd rather trim first, see if I can get away with 30's with just trimming, and then lift if I have to later. I know it is kinda backwards from what people normally do, but I'd rather see how much I can get out of just trimming the body before I have to start messing with the suspension and impacting driveability there. If I end up having to get a T-case drop at 2" I'll be pissed off because in that case I would have rather just have gone up to 3". Yeah, I wasn't sure if I should go with 30's or 31's but if your noticing a difference with 31's maybe I'll just stick with 30's. I drive long distances a lot, and also drive up the mountains a lot, I am nervous about losing power and the risk of overheating. Last edited by Greenspan; July 13th, 2018 at 08:49. Ok that scares me, that's exactly what I'm trying to avoid. I'd rather trim first, see if I can get away with 30's with just trimming, and then lift if I have to later. I know it is kinda backwards from what people normally do, but I'd rather see how much I can get out of just trimming the body before I have to start messing with the suspension and impacting driveability there. As mentioned, large tires can be installed on short or no lifts using bump stops. You will lose suspension travel and ride comfort unless you trim a lot, to retain the up travel. At stock ride heights, my 2001 XJ was regularly clobbering the rear bumper. Raising it just 2"s eliminated a lot of this. My 1997 XJ sit on a OME 2" lift kit. It did require a transfer case drop to eliminate rear driveshaft vibs.